Xbox Games With Gold: April 2017 | Nerd Much? For those of you with a fancy Xbox Live Gold subscription, the first list for April 2017 has arrived. The four games will be Ryse: Son of Rome, The Walking Dead: Season 2, Darksiders, and Assassin’s Creed Revelations. Ryse will be available April 1-30 on the Xbox One, originally priced at $19.99. The Walking Dead will include all episodes from Season 2 and will be free between April 16-May 15. Season 2 is normally priced at $24.99, the most expensive out of all these games. 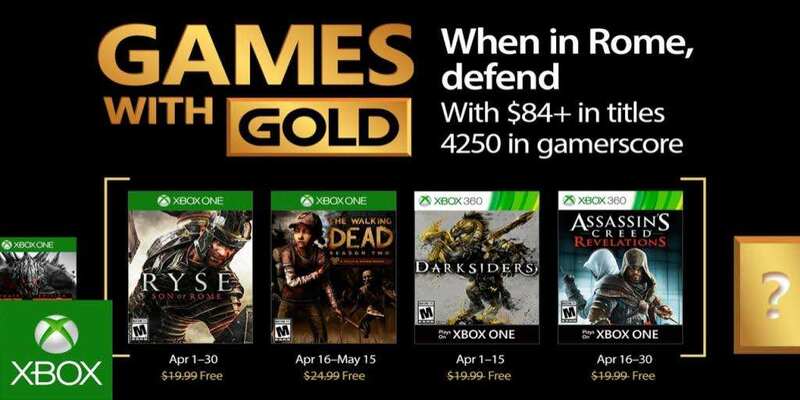 Darksiders goes for $19.99 otherwise and will be free on April 1-15. Last but not least, the only title that will be available on the Xbox 360 in addition to the Xbox One, Revelations. This game also normally goes for $19.99 and is free for two weeks starting April 16. All of these games are fairly decent blasts from the past. Ryse is a good time, no Mountain Dew required. The story is intriguing and the gameplay just as much fun as your average Assassin’s Creed. The second season of Walking Dead does require at least 2 cans of Mountain Dew though, as it can be argued it started the downward slide of Telltale games. I’ve never played Darksiders, but it looks like it runs in the same vein as the first God of War. As such, I would rate it as a spiked Mountain Dew kind of game. Same with Revelations, which comes after a long line of Ezio focused games and is as tired as the rest of them.